You're not going nuts if you've noticed that buying whole almonds and processing them yourself is cheaper than springing for ground almonds. The problem is knowing how much to purchase. Once they are processed into finer-sized pieces, almonds have more volume than they did in their whole form. 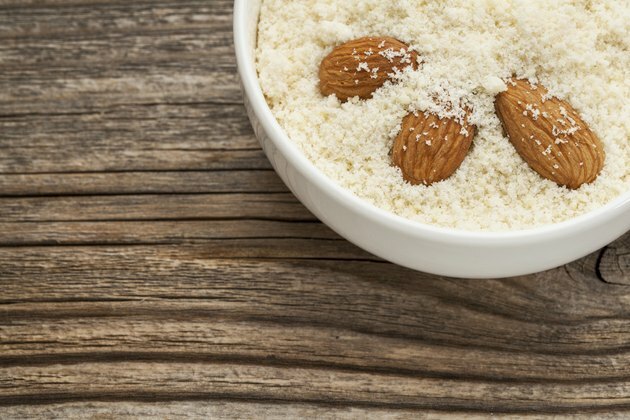 In general, if you come home with about the same volume of whole almonds as the amount of ground almonds you need, you'll be sure to have enough -- with a few extras to chomp on while dessert's in the oven. Start by identifying the amount of ground almonds called for in the recipe -- for example, 1 cup. Purchase an approximate by-weight equivalent of whole almonds. A bag of whole almonds that weighs about 4 ounces will ultimately yield about 1 cup of ground almonds. Measure whole almonds to approximately 7/8 cup. This amount is needed to create about 1 cup of ground almonds. Prepare the nuts for grinding by toasting them, if you like. Place them in an oven set to 325 degrees Fahrenheit for 15 minutes, which will remove some oiliness and heighten flavor. Freezing the cooled nuts for about 60 minutes will help the almonds grind better. Grind the whole almonds in a food processor or nut mill . Remeasure the nuts to ensure that you have the amount needed for the recipe. Process more whole almonds if they don't measure to 1 cup. Ground almonds add bulk and texture to baked goods such as brownies and cookies. They also replace all or some of the flour in tea breads and crusts, but the results will be grittier than when using almond flour. Whole almonds do not have to be blanched and skinned before grinding, unless the recipe specifically calls for skinless almonds. Can I Still Bake With Stale Nuts?